Below is an article with tips on how to achieve good posture. Here is an easy way to remember how to stand for Good Posture: DIBU. This acronym stands for, "Down, In, Back and Up." It also has the same pronunciation as the French word for standing straight or upright: 'debout' (de-boo). DIBU - Down, In, Back, Up - This means buttocks Down, stomach In, shoulders Back, and head Up erect. Easy, right?! Just remember 'DIBU' as you are walking along, and you will remember to do these four things. You will feel and look better, too. Good Posture is important for all of the body systems, including the digestive system. It also keeps your spine flexible and gives you a more youthful appearance. 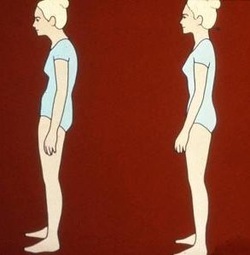 The 'Fountain of Youth' is your own perfect posture!